The seige of Jerusalem that began on the tenth of Tevet is marked — and observed each year as a public fast day — as the event that began the downward spiral toward the destruction of the Holy Temple in Jerusalem and the exile (galut) of the Jewish people from their homeland. The actual process, however, originated when the Jews began straying from G‑d, long before the seige of Jerusalem. The Children of Israel entered the Holy Land in the year 2488 from creation (1273 BCE) in the long-awaited culmination to their exodus from Egypt forty years earlier. Four hundred forty-seven years later, their settlement in the Land of Israel was consummated and a golden age was ushered in with the completion and dedication of the Holy Temple (Beit HaMikdash) in Jerusalem, wherein the Divine Presence came to dwell and manifest itself through daily miracles. Three times a year — on Passover, Shavuot and Sukkot — every Jew made a piligrimage to the Temple, "to see and be seen by the face of the L-rd G‑d of Israel." The Temple was supposed to last forever; this depended, however, on the Jews' adherence to the Torah and its mitzvot (Divine commandments). At first, the Jews kept the Torah and steadfastly retained their faith, enjoying peace, prosperity and a direct connection to G‑d through the Temple. However, after 300 years the Jews began to stray from the Torah and leave the path of their fathers. G‑d sent prophets repeatedly to admonish them, but the Jews refused to change their ways, choosing instead to deride these prophets as false messengers come to discourage them with predictions of destruction. Following is a brief recounting of the final years before the destruction of the Beit HaMikdash, excerpted from Our People, a book on Jewish history by Jacob Isaacs. JUDEA ON THE DOWNWARD PATH: Before his death, King Josiah designated his second son Jehoahaz as his successor to the throne, because he seemed to be more inclined than his older brother to follow in the footsteps of his father. Indeed the people proclaimed him king, but his reign was very brief. His reign lasted only three months, during which he did not live up to his father's expectations at all. His reign was terminated by Pharaoh Necho, king of Egypt, whose anger Jehoahaz had provoked. Necho advanced upon the land of Israel, attacked and captured Jehoahaz, and brought him in fetters to Egypt, where he died in captivity. Having exacted a heavy tribute from the people of Judah, Necho placed Jehoahaz's brother, Eliakim, on the throne, and changed his name to Joiakim. The newly-appointed king Joiakim, Josiah's eldest son, was much worse than his brother. He disregarded the laws of the Torah which his father had so strictly enforced in the land, and he set a poor example for his people by following the ways of wickedness and idolatry. The people were easily led astray inasmuch as their plight under the burden of heavy taxes made them restive and rebellious. With pain in his heart, the prophet Jeremiah watched this growing depravity of the people and sternly admonished them. "Roam about the streets of Jerusalem, and see now, and notice, and search in its broad places, if you can find one man, if there be one that executes justice, that searches for truth: And I will pardon it. And though they say, 'As the Lord lives!' surely they only swear to a falsehood. Oh, Lord, are not Your eyes directed to the truth? You did strike them, but they felt it not; You did make an end of them, yet they refused correction: they made their faces harder than a rock, they refused to return. Yet I myself thought, oh these are but poor; they are foolish; for they knew not the way of the Lord, the ordinance of their G‑d. I had better go unto the great men and let me speak to them; for these surely know the way of the Lord, the ordinance of their G‑d; but these altogether have broken the yoke, burst the bands. Therefore slays them the lion out of the forest; the wolf of the desert wastes them; the leopard lies in wait against their cities: Everyone that comes out thence shall be torn in pieces; because many are their transgressions, very numerous are their backslidings." In vain did Jeremiah reprove the king, warning him of the imminent doom which would visit the land. In vain did he paint the gloom and despair that would prevail when G‑d would punish the people for their faithlessness, immorality, and injustice. There were so many false prophets who misled the king and the people by their predictions of glorious days to come that Jeremiah's words were unheeded; nay, he became an object of public ridicule and derision. Every day that passed without any disturbance to the normal life of Jerusalem afforded another opportunity for the people to make Jeremiah appear ridiculous and insane. They challenged him and his Divine mission: "Where is G‑d's word? Why does it not come true? G‑d is not, and misfortune will never reach us." Jeremiah never ceased to admonish the people, and he was finally put in prison by the king. Meanwhile Nebuchadnezzar, at the head of a large army, was advancing upon the land of Israel. The king and people were determined to oppose them, despite Jeremiah's pleas that opposition to the Babylonians would spell disaster. JOIAKIM IS DETHRONED: For three years Joiakim remained obedient to the king of Babylon. Then he revolted and joined forces with Egypt against Nebuchadnezzar. To punish this rebellion, the king of Babylon again sent his armies into Judea. They put Joiakim in chains and led him into captivity. But while the Babylonian forces were on their way home, Joiakim died, and was succeeded by his son Jehoiachin (or Jechoniah). The new monarch had been on the throne for scarcely more than three months when Jerusalem came under the siege of the Babylonian hosts. To appease Nebuchadnezzar and save the city, Jehoiachin delivered himself up to the Babylonian conqueror, together with his motherand all his chief officers. After plundering the Temple and the royal palace, Nebuchadnezzar returned to his land, carrying away from Jerusalem ten thousand captives, including the king and his family, the nobility of the land, and the leaders of the army. Only the poorest of the population were left, and over them Zedekiah eventually became king. ZEDEKIAH'S REBELLION: Zedekiah was twenty-one years old when he ascended the toppling throne of Judea. The admonitions of Jeremiah and the other Divine prophets went unheeded. There was no sign of a general repentance and return to G‑d, and the fate of Judea was sealed. Zedekiah had sworn allegiance to the king of Babylon, but he broke his vow, and secretly joined Egypt in the attempt to throw off the yoke of Nebuchadnezzar. Turning a deaf ear to Jeremiah's entreaties and warnings, Zedekiah entered into an alliance with Egypt. In the ninth year of his reign, Zedekiah openly declared his revolt against the Chaldeans. Again Nebuchadnezzar led a vast army to quell the revolt. Remaining at Riblah, he sent his troops southward under the leadership of Nebuzaradan, his chief general. On the tenth of Tevet, in the year 3336, Jerusalem came under siege. JEREMIAH'S ADVICE IGNORED: Now Zedekiah sent word to Jeremiah asking him to pray to G‑d for help. Jeremiah replied that the fate of Jerusalem was sealed, and that Zedekiah, his sons, servants, and all those who remained in the city would be mercilessly slain. Only those who submitted to the Babylonians would be spared. Zedekiah did not listen to Jeremiah's advice, and he refused to surrender. JEREMIAH THROWN INTO PRISON: Meanwhile Nebuchadnezzar was forced to abandon the siege of Jerusalem temporarily, because the king of Egypt had led a large army against him. Jeremiah predicted, however, that the Chaldeans would return and again attack and destroy the city. Jeremiah, who had been tolerated thus far, was now accused of being in league with the enemy, and was consequently thrown into prison. The desperate king, however, recalled him from the dungeon and asked him for a message from G‑d. But once again Jeremiah could reiterate only what he had told him before. The king's fate, like that of the city, was sealed; nothing could prevent their falling into the vengeful hands of the enemy. Then Jeremiah asked for a better prison than the dungeon in which he had been held. The king granted his request, and every day he was given a loaf of bread, until the time when the supply of bread in Jerusalem gave out. JEREMIAH THROWN INTO MUDPIT: Jeremiah's repeated predictions of the fall of the city and his pleas for surrender roused the anger of the defenders of the city. The prophet was seized by his enemies and thrown into a pit where he almost drowned in mud. A servant of the name of Ebed M'elech of Kush heard of this and reported it to the king Zedekiah. The king ordered the servant to pull Jeremiah out of the pit. The man did so and saved the prophet's life in the nick of time. Again Zedekiah had Jeremiah brought before him and asked for the Divine message. Jeremiah asked whether he could talk freely, without fear of being killed. The king swore that no harm would befall him, regardless of what he would say, and added that he himself would protect Jeremiah from his enemies. Then Jeremiah told the king that if he would leave the city and surrender to the enemy, he would live and the city would be spared. But the king was afraid of the people's wrath and did not dare to act upon the prophet's advice. After that Jeremiah was put safely behind prison bars and remained there until after the capture of Jerusalem. CAPTURE OF JERUSALEM: In the eleventh year of Zedekiah's reign, in the month of Tammuz, after a long (two-and-one-half years') siege, during which hunger and epidemics of disease raged all over the city, the walls of Jerusalem were breached by the enemy. The king fled through a subterranean passage, but he was captured in the plains of Jericho and brought before Nebuchadnezzar in Riblah. There the king's sons and many other Jewish princes were slain before his eyes; then his own eyes were put out, and he was led in chains to Babylon. NEBUCHADNEZZAR DESTROYS JERUSALEM: On the seventh day of Av the chief of Nebuchadnezzar's army, Nebuzaradan, began the destruction of Jerusalem. The walls of the city were torn down, and the royal palace, and other structures in the city were set on fire. On the ninth of Av, towards the evening, the Beit Hamikdosh was set on fire and was destroyed. Everything of gold and silver that still remained was carried off as loot by Babylonian soldiers. All the beautiful works of art with which King Solomon had once decorated and ornamented the holy edifice were destroyed or taken away. The holy vessels of the Temple that could be found were brought to Babylon. The high priest Seraiah and many other high officials and priests were executed. Many thousands of the people that had escaped the sword were taken prisoner and led into captivity in Babylon, where some of their best had already preceded them. 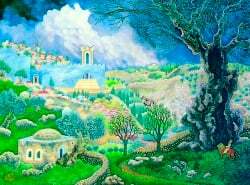 Only the poorest of the residents of Jerusalem were permitted to stay on to plant the vineyards and work in the fields. Over these Nebuchadnezzar set a governor, Gedaliah, the son of Ahikam, a great friend of Jeremiah. Upon Nebuchadnezzar's orders Jeremiah was released from prison and saved from the cruel fate that befell the other leaders of the people. Nebuchadnezzar took off Jeremiah's chains, and allowed him to choose between remaining in his native land or going to Babylon, not as a captive but as an honored guest. Jeremiah preferred to stay and end his days on the holy soil of Judah. Thus ended the empire of David and Solomon; thus the magnificent city and holy Temple were destroyed. Thus G‑d punished His people for deserting Him and His laws. All this had been predicted in the Torah, and it truly came to pass with all the horror of which Moses had warned. Yet G‑d also preserved His covenant with the people of Israel, and another prophecy of Moses came true. This prophecy was remembered by the Jews in exile and lightened the burden of their suffering for it contained this promise: "And yet, for all that, though they be in the land of their enemies, will I not cast them away, neither will I loath them to destroy them utterly, to break My covenant with them; for I am the Lord, their G‑d. And I will remember for their sake the covenant of their ancestors, whom I brought forth out of the land of Egypt before the eyes of the nations, that I may be unto them G‑d; I am the Lord." Choices are everything Everybody has of course heard of all the cancers, a whole plethora of heart ailments, not to mention all the other assorted ills, bleeps and blundered human beings are subjected too. But celulitis? That wierd condition of an infection of the sort tissue. This my fourth bout that I can recall has me going each morning for intravenous anitbiotics watching Good Morning America and watching the Universe having an extreme case of celulitis itself. Well, I could have chosen to go for treatment on the day when I fell that touched it off, but chose to proceed onward to Shabbat services. That led to a choice to wait 6 days before seeking treatment. Every time I have quiet time the thought "you know what you did" keeps occuring. We must go to do acts of kindness, teshuvah, tzedakah and Torah study as quickly as attending to a life threatening injury or illness. The kings of Judah failed to realise that although Egypt was useful as a place of refuge in times of famine and trouble, it was not powerful enough to protect Jerusalem against northern powers such as the Assyrians and the Babylonians. The Temple was restored under Persian patronage and this remained the dominant power until the Greek invasion under Alexander. The times when real independence was possible were long gone and the destruction of the two temples was the result of a failure to recognise that fact. Jewish people The history of the Jewish people is amazing it is Israel the Jewish people that prove the eternal love of G-d for His creation.People go about their lives and seem to have little time to honor G-d,I think we live in a time of history that will decide the path of all people some to honoer G-d some to destruction sadly.Your Lectures are wonderful and of great insight, I pray one day all people will be able to read them, You are a light to many nations and hope to many people, thank you. Temple destroyed by Romans Thank you for the detailed description of the destruction of Jerusalem and Solomon's temple. Extremely sad indeed. The temple was rebuilt and cruelly destroyed again by the Romans. Why was G-d so angry to allow that to happen again? What must Jews do to gain G-d's favor and have the temple in Jerusalem rebuilt?